Wow. They should go on R’lyeh’s Best Dance Crew. I think they could beat the Jabawokeez. Dancing when the stars are right! Oh, come on with the updates! This is the reason i have internet access in my home! If i were stranded on a island i would want lolthulhu.com and cheesecake! Yeah, I know, I’m slackin’ off. I actually don’t have TOO much more to put up, but there’s still stuff sitting in my inbox which needs sifting-through from ages ago. I’ll see if I can get my act together for next week. 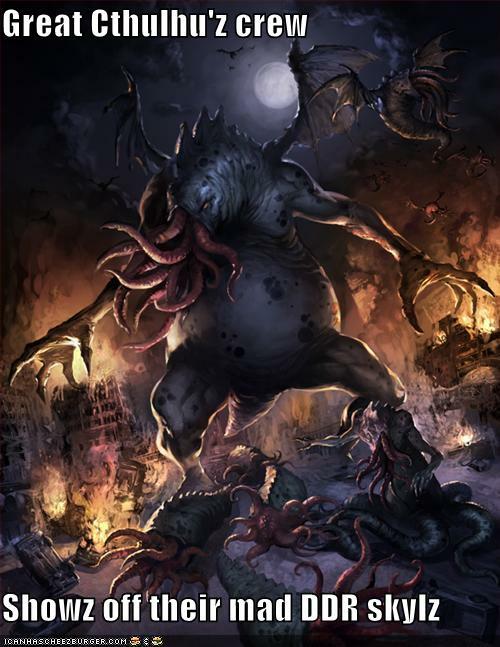 Ya – they’re giving a bigger release to the Shadow Over Innsmouth knockoff “Cthulhu”, so maybe that will boost the site. Let’s greet that movie properly! O hai. Dis site dead 4evaz? Awwww…. The Lovecraft Film festival is in a couple of weeks and we get no updates? Whats up with that? Seriously, update the site dude. Learning 2 use a box of plastic. LOVE the images I’ve seen on the site! want more SOON!!!!!!! Awesome picture and caption, though! Any chance of posting the last few you alluded to in July? Will you please answer us instead of just ignoring what we are saying? That isn’t cool. Just asleep until the stars are right. Not dead, Calavera, merely sleeping. At R’lyeh. Waiting…Waiting,…for the stars to align. Dagon needs to command the Deep Ones to open this MO-FO (again) already. This site was ambushed by cultists on its way home and drugged, raped and sacrificed to the Elder Gods. However, its spirit still lingers in the dark, foul debths of the internet and haunts the web for all eternity. IA! CAN I HAZ LOLTHULHU NOW? is this site still updating? Copyright © 2007-2019 LOLTHULHU. Based on the Darkwater Theme by Antbag.